St. Mary’s University will engage the community in exploring San Antonio’s origins; its early political, economic and social history; and its Hispanic legacy at a lecture on Tuesday, Sept. 25. The annual O’Connor Lecture, “San Antonio de Béxar in the 18th Century,” will feature Gerald E. Poyo, Ph.D., St. Mary’s University Professor of History and O’Connor Chair for the History of Hispanic Texas and the Southwest. The free program will begin at 7 p.m. on Tuesday, Sept. 25, in the University Center, Conference Room A. A reception will follow the program. Guests who would like to attend the reception should RSVP online no later than Friday, Sept. 21. Attendees will also have the rare chance to view on campus a collection of five 19th century paintings of the San Antonio Missions by Jean Louis Théodore Gentilz (1819–1906). Gentilz taught art at St. Mary’s College from 1864 to 1894. His highly detailed realist works are owned by St. Mary’s University but are typically housed at the San Antonio Museum of Art. The paintings will remain on display in the University Center, Conference Room B, through Wednesday, Oct. 31. Those traveling to campus can park in Lot D, near the NW 36th Street entrance, or Lot H, near the Culebra Road entrance. San Antonio de Béxar, founded 300 years ago, brought together mission, military and civilian communities along the San Antonio River, each with different ethnic compositions and goals. They became an integrated agricultural and ranching community with a distinct regional and social identity. 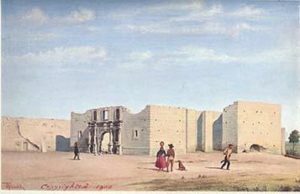 An important presence that confirmed Spain’s imperial claims in Texas, San Antonio eventually became a contested town as the United States moved its boundaries westward. Join in this exploration of San Antonio’s origins, its early political, economic and social history, and its Hispanic legacy — still at the heart of the city’s identity. Jean Louis Théodore Gentilz, son of a Parisian manufacturer of custom-built carriages, was born in Paris in 1819. Trained as a draftsman, painter and engineer, Gentilz first came to Texas in 1844 to help establish the French settlement of Castroville and later settled in San Antonio. In 1849, Gentilz travelled to Paris where he married Marie Fargeix-an and returned to San Antonio with his new wife. He became one of Texas’s earliest professional artists and art teachers, recording both the daily life of Castroville and San Antonio, and historic structures such as the five Catholic missions that came to define the region. He is known for his realistic portrayal of customs in early Texas and the Southwest. 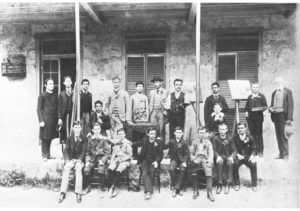 Founded as St. Mary’s Institute in 1852 on the banks of the San Antonio River in the heart of what is today downtown, the school that which Gentilz taught art from 1864 to 1894 later became St. Mary’s College, and then finally St. Mary’s University in 1927. Gentilz died in San Antonio on Jan. 4, 1906.